The Holy Assumption Cathedral: the relic is immortal. The Assumption Cathedral in Vitebsk is one of the most unique churches in Belarus, which was built in a picturesque place of the city - on the high bank of the Western Dvina River. Earlier there was an old church, destroyed during the Soviet era. But at the beginning of the XXI century the temple rose. 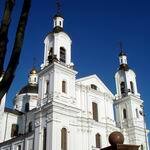 Today it is the only cathedral in Vitebsk, the lower active layer of which is located underground. Modern Vitebsk admires tourists with not only amazing architecture, but also rich history. Even if you're for the first time in the city and do not know what to see in Vitebsk, take walk through the streets, drowning in the lace of parks and public gardens. 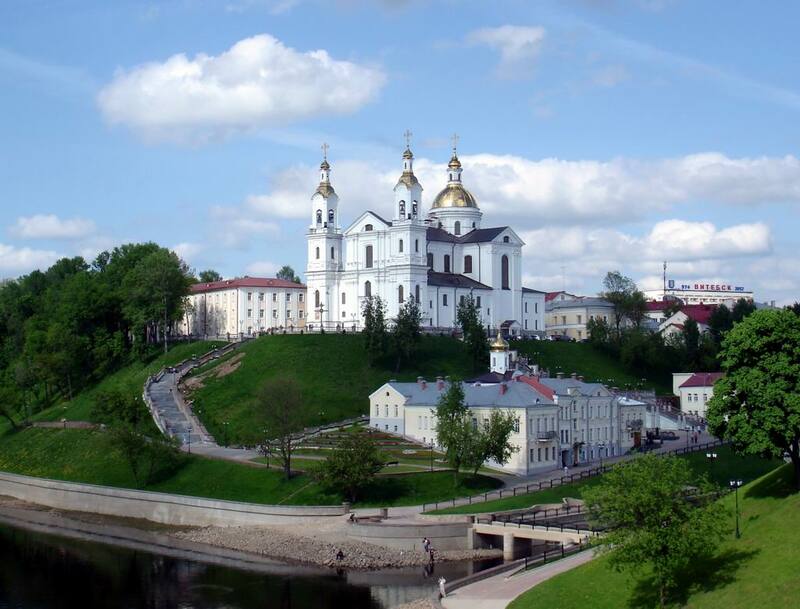 And one of the trips will necessarily lead you to the Holy Assumption Cathedral – one of the outstanding monuments of the architecture of Vitebsk. You will be impressed by not only external monumentality and solemnity of the temple, but also internal decoration, which surrounds the cathedral with bright light and warmth praising the parishioners for well doing. 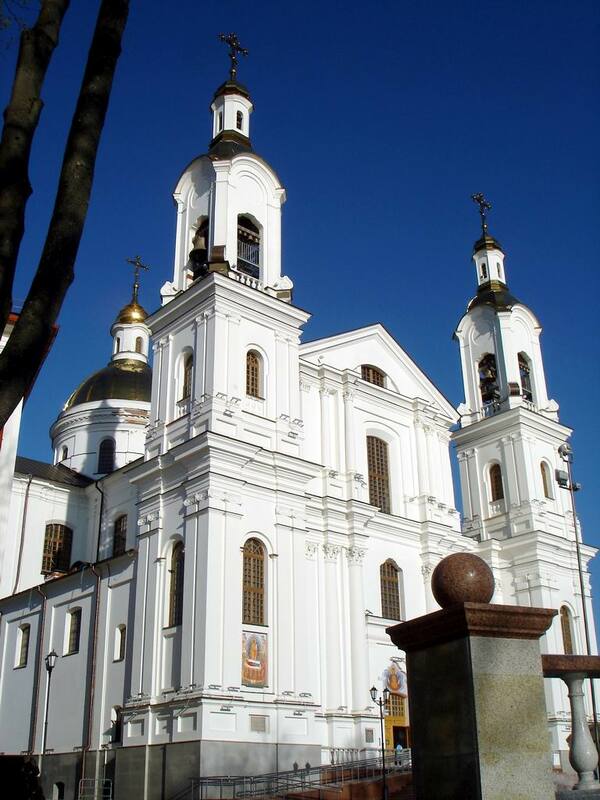 There are a lot of legends in the city of Vitebsk related to the Holy Assumption Cathedral. According to one of them there is an underpass in the temple leading to the Western Dvina River. Although, in fact it was not at all an underpass, but a sort of drainage system, built during the construction of the Holy Assumption Cathedral. Thanks to it the ground waters were removed from the basement of the temple to the Western Dvina River. The height of the vaults was such that one could pass to the utmost. After studying the history of Vitebsk in details, it becomes clear that Assumption mountain, where now the cathedral stands, has been used for construction of religious buildings during thousands of years. Initially, there was a pagan shrine. With the birth of Christianity a church was built at this place, which burned more than once in fires. One of the fires dated to 1708, when Vitebsk was burned by order of Peter I. The church with a monastery also burned. 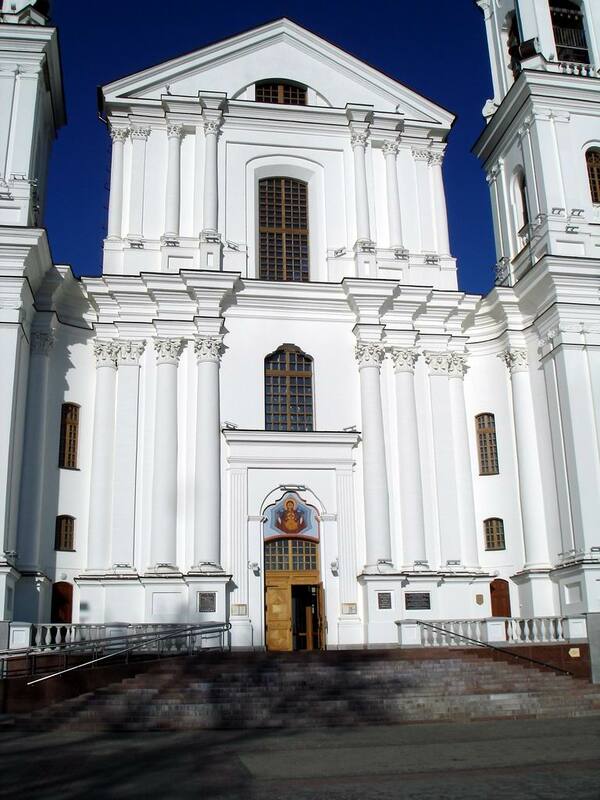 But soon Vitebsk resident Adam Kisel restored the monastery buildings at his own expense and the church, named in honor of the Assumption of the Blessed Virgin, was rebuilt for the money of the monastic brotherhood – from that moment the history of modern Assumption Cathedral begins. However, the church was so small that in a couple of years, in 1715, a bigger temple was built on donations Vitebsk native Miron Galuzo. But the renewed church was again doomed to a quick death: in 1722 it burned completely again. This time people did not hasten to re-build the burned temple of Vitebsk. The construction of a stone church began only in 1743. The project was developed by Grodno architect Joseph III Fontani. Some literary sources claim that the church developed project is of particular value for the architecture of Vitebsk as it was a reduced copy of a Roman temple. But the church has not expanded the number of attractions in Vitebsk – the construction that rapidly began soon died out. Only after Vitebsk province joined the Russian Empire, first progress outlined. In 1775, Governor-General Earl Z.Chernyshev ordered to complete the construction of the present Assumption Cathedral. And the deadline was just two years. However, by 1777 only managed to rebuild еру church, the monastery was completed in 1785. 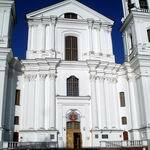 In 1799 there was a bright event in the culture of Vitebsk: according to the decree of Emperor Paul I, the church was renamed into the Assumption Cathedral. Since the beginning of 1812 the fortune turned away from the temple again, it was ruthlessly robbed by French troops. However, after the war it did not keep the cathedral from lifting up its head and become a bright highlight of the architectural monuments of Vitebsk. After establishment the Soviet power in Vitebsk, the Assumption Cathedral was closed, and in 1936 the temple was blew up. Some sources mention an earlier destruction of the temple – in 1934, but the essence remains. Sure, it was a great loss for the culture of Vitebsk. Then, many residents of the city saw a miracle: there were no fragments of the walls on the place of the cathedral, but separate bricks of the church. After 15 years a workshop of the grinding machines factory was built on the place of the Assumption Cathedral, but in the 80s the building fell into disrepair, and in 1998 the workshop was demolished. The project to restore the Assumption Cathedral in Vitebsk was actively developed already in early '90s. In 1998, the Patriarch of Moscow and All Russia Alexy II laid a capsule with a commemorative diploma and blessed the first stone at the place of the temple construction. During the archaeological excavations that preceded the restoration of the Assumption Cathedral specialists determined the exact location of the temple. At the same time the remains of people have been found – most likely victims of the NKVD or the Nazi Gestapo. They were buried near the church – a tablet witnesses on the north wall of the Cathedral. In June 2000 active restoration of the ruined church of Vitebsk began. And three years later the first liturgy was made in the lower layer of the temple being built in honor of the Transfiguration of the Lord. The lower layer was finished in 2005. Exactly one year later the ground floor of the Assumption Cathedral was elevated, and by the end of 2007 construction of the first one was completed and the bell tower was erected. In 2008 10 bells were installed on the south tower. In March 2011 another set of 11 bells adorned the north tower. By the way, the largest bell in Belarus is installed here, its weight - 5.2 tones. The ceremonial opening of the Assumption Cathedral, dedicated to the great church holiday – the Annunciation – was held on April 7, 2011. If you're for the first time in the city and do not know what to see in Vitebsk, you can look into city portal VitebskCity.by. Here you will find information about the facilities located not far from the Assumption Cathedral. They include no less interesting attractions of Vitebsk – the City Hall, Yakub Kolas Theater and the Resurrection Church. A walk in Kirovsky Bridge will impress with picturesque landscapes of Vitebsk. Address of the Assumption Cathedral: 9 Krylov str., Vitebsk.